Set to be launched in 2018 from Kourou, French Guiana, the JWST will embark on a journey to unravel the universe’s mysteries, "from discovering the first stars and galaxies" to "studying the atmospheres of alien planets around other stars." “This was the first time all the different parts worked together at the same time, and this was the first time it was tested against the actual spacecraft flight hardware,” explained Alan Johns, ground segment and operations manager for the Webb telescope at NASA’s Goddard Space Flight Center. NASA called, and the Webb telescope responded. 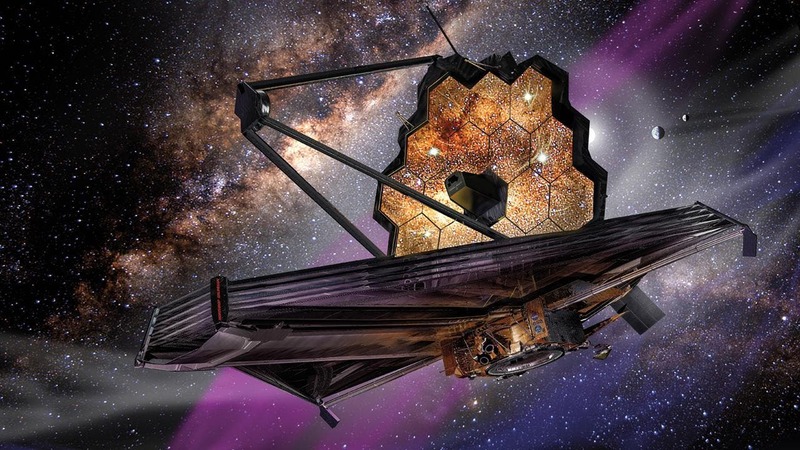 NASA’s James Webb Space Telescope recently completed its Ground Segment Test Number 1 (GSEG-1), for the first time confirming successful end-to-end communication between the telescope and its mission operations center. The Deep Space Network comprises three ground stations located about 120 degrees apart on Earth — one each in Canberra, Australia; Madrid, Spain; and Goldstone, California. This photo shows an antenna at the DSN site in California. GSEG-1, which completed on June 20, tested all of the communications systems required to support the telescope’s launch, commissioning and normal operations once it is in orbit. The test showed successful end-to-end communication between the Webb telescope’s spacecraft bus, currently located at Northrop Grumman Aerospace Systems in Redondo Beach, California, and the telescope’s mission operations center at the Space Telescope Science Institute in Baltimore. Before this test, the flight operations team had only verified communication with the telescope piecemeal — in several smaller tests that were not end-to-end. During the test, the team sent the same command procedures to the telescope that will be sent during its nearly 1 million mile journey to its orbit at the second Lagrange point, known as L2. The team verified the configuration of the telescope’s onboard computers and also received telemetry from the telescope, including science data and health monitoring data. The ground segment test consisted of two parts — the Space Network (SN) portion and the Deep Space Network (DSN) portion. The eight‑hour‑long SN portion of the test, completed May 24, tested all of the communications systems required during Webb’s launch phase. During this portion of the test, the team successfully exchanged commands and telemetry with the telescope using NASA’s Tracking and Data Relay Satellite (TDRS) network. The 13‑hour‑long DSN portion of the test, completed June 20, tested communications systems that will be used from the end of Webb’s launch phase through the end of the mission. During this portion of the test, the team successfully exchanged commands, telemetry and ranging data with the telescope, as well as offloaded information from the telescope’s data recorders. The DSN comprises three ground stations, located about 120 longitudinal degrees apart from each other on Earth — one each in Canberra, Australia; Madrid, Spain; and Goldstone, California. The placement of these guarantees the Webb telescope will be able to contact at least one station at all times, to remain in constant communication with Earth. For this test, the telescope communicated with a specially designed trailer that mimics these ground stations, rather than the ground stations themselves. Another communications test will take place at the telescope’s planned launch site in Kourou, French Guiana, about a month before launch in late 2018. This test will demonstrate the expected connectivity with the telescope at first contact with it, which will occur approximately three-and-a-half minutes after launch. NASA’s James Webb Space Telescope is the world’s most advanced space observatory. This engineering marvel is designed to unravel some of the greatest mysteries of the universe, from discovering the first stars and galaxies that formed after the big bang to studying the atmospheres of planets around other stars. It is a joint project of NASA, ESA (the European Space Agency) and the Canadian Space Agency.